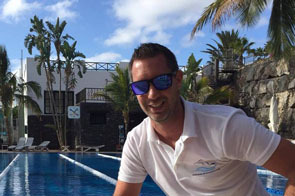 Visiting us here in Lanzarote, you can stay at Fariones Resort Hotels and apartments and attend the sessions at our training centre here in Puerto Del Carmen or sessions can be provided at a private villa which must be mentioned at time of booking or sessions will take place at our training centre by default. We have a list of approved villas that you can choose which are disability adapted for our services in a variety of locations throughout the island. Once you have made your booking the team working behind the scenes for private disABILITY DEVELOPMENT weeks in Lanzarote is quite extensive. After you have selected the dates that work for you our Camel Travel will assist you with flights and accommodation details. Once that is all in place you will be assigned a key contact. Your key contact will be responsible for all of your questions, communication and queries prior to travel and throughout your stay. You will have access to your very own account to communicate with us which will help us to create a very unique training week just for you.